A new prestige limited edition of Bollinger R.D. 1988 in Magnum with a unique crystal piece of art which can be used as an ice bowl, with a carbon covering on top. Only 307 of the Crystal sets have been produced, crafted by Saint-Louis crystal works in Lorraine, to showcase the producer's R.D. 1988 Bollinger - part of the Bollinger's late-release and recently disgorged prestige cuvée vintage Champagne range. Each crystal bowl will be individually numbered. 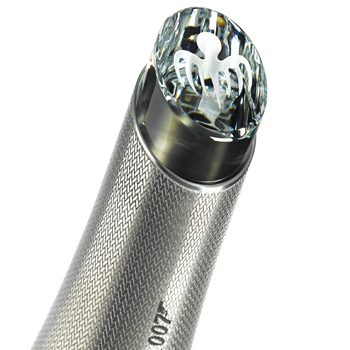 Designed by Eric Berthés of Saint-Louis, which was founded in 1586 and is now part of the Hermes Group, the Bollinger SPECTRE Crystal Set features a Bollinger 007 signature marked with the sign of the octopus, the SPECTRE. For this exceptional creation, Champagne Bollinger has chosen a partner that shares the same values of French excellence and exacting standards of quality, the Saint-Louis Crystal works, said Jérôme Philipon, president of Champagne Bollinger. 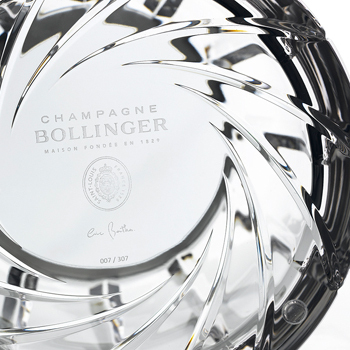 Champagne Bollinger has also released a limited edition bottle of its 2009 cuvée inspired by the style and sophistication of the world of Bond - to mark its association with the franchise. To the eye, an intense gold with subtle hues. On the nose, notes of brioche, honey and dried apricot - evidence that Bollinger R.D. 1988 is in prime maturity. This wine shows aromatic strength and great length in the mouth, with notes of preserved lemon in the finish. Bollinger R.D. 1988 is a full-bodied champagne and will remain in a condition of perfect balance for a long time to come. In order to fully appreciate its unique style, bouquet and aromas, it is best served between 8°C and 10°C, or more. Bollinger R.D. 1988 can be enjoyed right away, or you may choose to let it mature further: its ageing potential is endless. Magnums disgorged 1st September 2003. The grapes only come from the grands and premiers crus from Champagne. 70% of the grapes come from Bollinger's own vineyards. 17 crus had a part in the composition of the blend of RD 1988. 66% of the grapes came from grands crus; 34% of the grapes came from premiers crus. These were mainly from Aÿ, Verzenay, Louvois, Mesnil s/Oger, Oger and Cuis. RD 1988 was only produced from the cuvees. The first fermentation of the wines was done in oak casks. The oak casks, which are a minimum of four years old and contain 205, 225 or 400 litres, allow a fermentation by marc and therefore ensure a greater flexibility at the time of blending. They also ensure the development of more complex aromas and enhance the ageing potential of the wines, without imparting wood flavours. The blend is mainly made up of Pinot Noir from grands and premiers crus. RD 1988 is aged in Bollinger's cellars for a minimum of ten years under cork closure. After blending, bottling, and second fermentation, the RD 1988 rested for a minimum of ten years on its lees, time necessary for the aromas to fully develop. The recent disgorging, the date of disgorging is inscribed on the back label, gives the wine an exceptional freshness. This ageing in the bottle is done under cork closure, since, after more than four years on the lees, this method offers the wine a better protection against oxidation compared with a crown cap. The dosage is very low, "Extra Brut", having 3 to 4 grams of sugar per litre. The RD 1988 will rest for three months in the cellar after disgorging and before shipping. This is the necessary time for the wine to assimilate the dosage and to recover suitable balance for tasting. The 1988 vintage was of very good quality. Nothing altered the natural development of the vine, except for a rainy late season which allowed grey rot to develop in some of the crus of Pinot Noir. The flowering happened between 16 and 21 June. A rigorous sorting out of the grapes allowed Bollinger to bring in grapes in good condition. The yields reached 9,000kg per hectare and the average alcohol of the musts was 9.2° with a very good acidity.